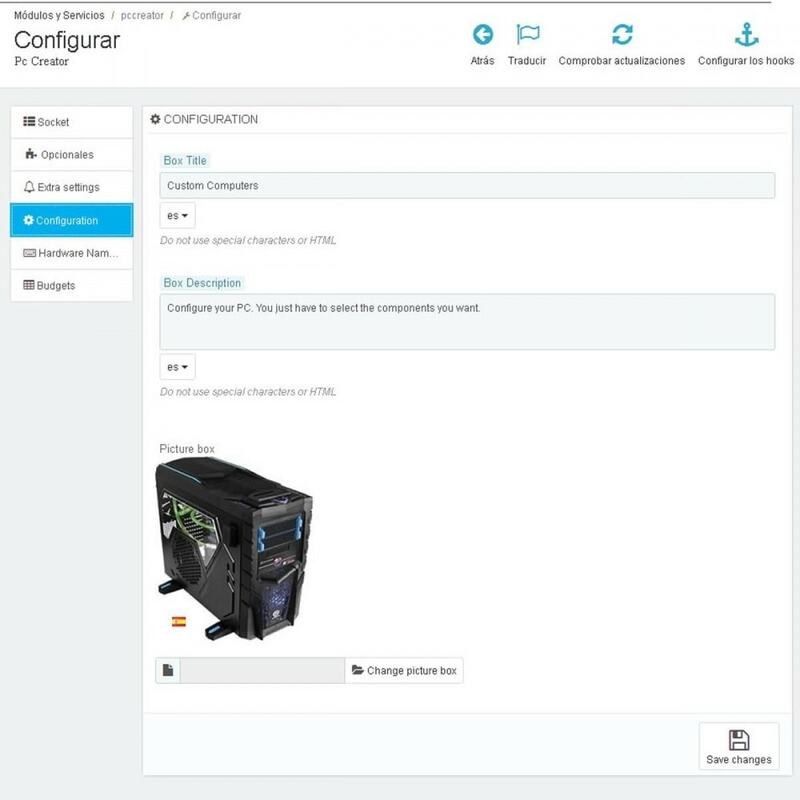 Offers your customers the possibility to create custom computers, selected from the items in your store you sconfigure. The module allows you to create 24 different hardware options. Functional in mobile devices and tables. Budgets can be shared in social networks. A same budget can be sold indefinitely. Budgets will always show current amounts. Paper printed budgets expires in 15 days . The module manages all automatically. 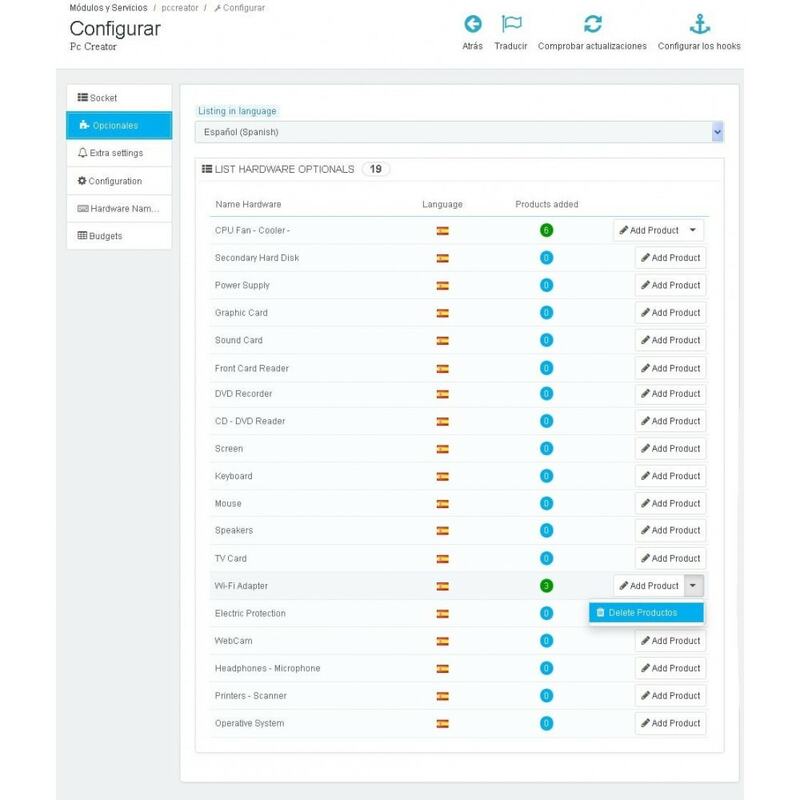 The module beggins managing products and required options from a value set as initial option and that value is “Base Socket”. This means that the socket name is the starting point to load required components. You can activate all optionals as you like. All hardware names can be edited in your store BO. Customers will find a funny way to create a custom computer in your shop. Can create the computer and view its price in real time. The module requires PHP 5.3 version minimum and your theme must have at least one column to be installed. Important: if your version is older than 7.0.1 and want to upgrade , you must consider the module will delete obsolete files and BD tables. When reached the final version it will uninstall and install itself automatically. In this case, you must consider that all previuos configuration will be deleted. When module is installed, it will create all texts that are part of the pages for the customer. All texts can be edited by administrator. The module is translated into two languages: English and Spanish. If you use other different languages you must modify all texts the module generates. The module will automatically generate text for every available language. Update - BO - load from budget view to link in new window "target blank"
Upgrade - BO - compiler js adapted to module needs. 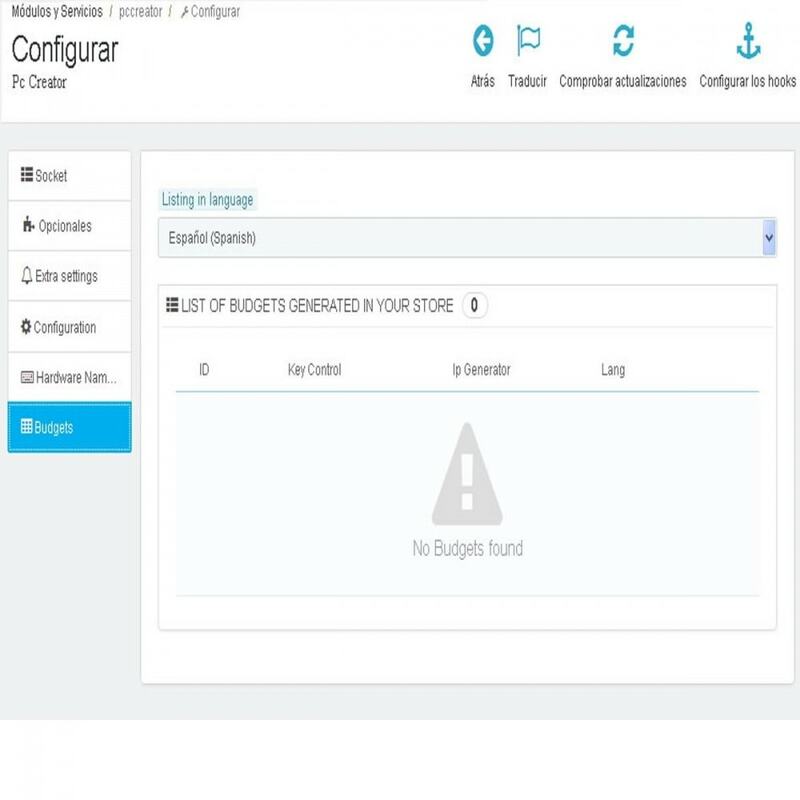 Update - FO - FIX Touch bootstrap : Touch patch, fix Bootstrap error in forms displayed on mobile devices and tablets. Update - FO - HTML5 methodology for user side data transmission and reception. Update - FO - New design page budget integration Bootstrap 4.x inclusive. upgrade - FO - New Touch Event Support for jQuery UI - Tested on iPad, iPhone, Android and other touch-enabled mobile devices. Upgrade - Fo - Mobile or tablet detection, auto device position management.Add alert message if the device is not in its proper width or horizontal position. 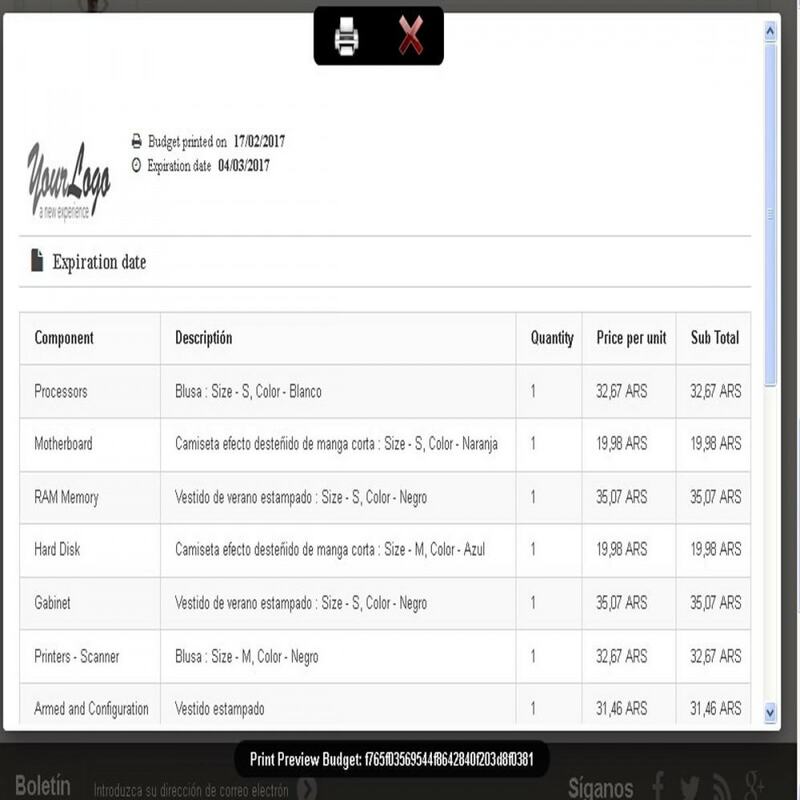 update - FO - budget expiration date only visible in pdf or paper prints. update - FO - Informative message of 15 days of validity only visible in pdf or paper prints. Eyeglass Tester OnlineDo you have an eyeglasses e-shop? So here is an essential module for your store. Let your visitors or customers try on-line all eyeglasses frames for sale on your shop. Have another sales point inside your e-shop.